About: Hake Publishing gave me the chance to review their Hake/Saxon Grammar and Writing 3 curricula. 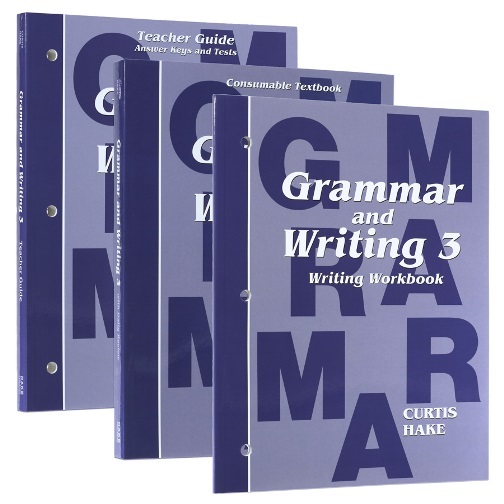 This is a 3 book set containing the teachers guide, grammar text book, and writing workbook. The teachers guide has a schedule, script for Grammar Meetings, answer key and the masters for tests along with extra practice pages. It is approximately 300 some pages. The student text is a consumable book that has 111 lessons of grammar. Finally you have the writing workbook which contains 21 lessons of writing exercises. It is important to follow along in the book in order each thing builds on each other. The program schedule has been made to help you best learn the lessons. We really enjoyed this book. I love having a premodern schedule because then my kids know this is how it works and I’m not just being a slave driver with work. We love being able to open up and know what is going to be expected of me each day. We do launguage daily during the week. Every 5th day there is a test. These are good for those in state where you have to show testing and progress within your record keeping. My daughter is dyslexic but we didn’t find to to be to hard for her follow along. We loved Saxon math and this was set up the same way. I think this is a great full curriculum for anyone that needs something for grammar and writing. The extra pages in the teachers guide were nice for those lessons that we needed some more practice with. The perforated pages are also great because for a dyslexic student holding a whole book can be overwhelming and this helps separate it up for them. Then the review sections really help tie it all together to make sure your child is getting and retaining all of the information taught. Be sure to check into what my fellow homeschool crew members had to say about the program with their children.